The Island Highway (Hwy 19) begins in Nanaimo and continues north for 390 km (242 miles) to Bear Cove. 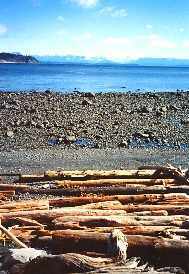 The route to Campbell River (152 km or 94 miles) is a pleasant journey through forested landscape and rolling hills,with views of the Strait of Georgia, the Gulf Islands and the Coast Mountains. Excellent accommodation is found along the way. 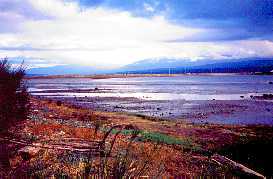 Stops along this northern route include Lantzville, Nanoose Bay, Brant Goose Feeding Area (a rest and feed area for migratory waterfowl), Rathtrevor Beach Provincial Park (one of the island's most popular camping spots), Englishman River and Parksville. Named after its first settler and postmaster, Parksville offers the visitor over 1.5 km (1 mile) of sandy beach, salmon and trout fishing in the Englishman and Little Qualicum Rivers, as well as various resorts and tourist facilities. Interesting spots nearby include the Coombs Country Market and Emporium, Cathedral Grove and the Wild Rhododendron Reserve. Lasqueti Ferry to Lasqueti Island: Popular with bikers and paddlers, access to Lasqueti Island is via a foot passenger ferry just off of Hwy 19 at Lee Road. This retirement and tourist spot is known for good salmon fishing, beach combing and golfing. Great beaches, specialty shops and galleries are just some of its attractions. 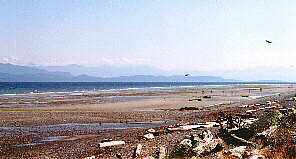 Qualicum Beach is located 47 km (29 miles) north of Nanaimo. Take Hwy 4A as an alternative scenic road from Hwy 4 to Port Alberni and the west coast of the island. 61 km (38 miles) north of Nanaimo is the Horne Lake Road which leads west to the Spider Lake Provincial Park and Horne Lake Caves Provincial Park. Two self-guided and three guided tours are available to the caves. Continuing north you will pass communities including Bowser, Deep Bay, Rosewell Creek Provincial Park and Fanny Bay. 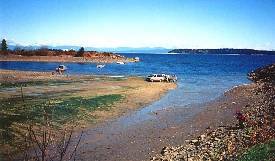 A car and passenger ferry to Denman Island (and from Denman onto Hornby) is located at Buckley Bay. Founded in 1888 by Robert Dunsmuir, this once prosperous coal mining town offers a glimpse into its historic past through ancient buildings in the Chinatown area. Other historic buildings still in use include those housing the hospital (1894) and the post office (1907). The last coal mine closed in 1966 and now the town is a peaceful resort village offering access to the beautiful valley surrounding. Turn west on the Cumberland road 102 km (63miles) past Nanaimo. Continuing past Cumberland, visitors will reach Comox Lake and Lakes Chain. Or return to Hwy 19 and continue north. Located mid-island in a fertile valley which backs into impressive mountains, Courtenay-Comox is 107 km (66 miles) north of Nanaimo. White settlers from the Hudson Bay Company first arrived in 1860 with farming interests in the area. A Canadian Forces Base is located here. Opened in 1942, this base specializes in sea-air rescue and maritime patrol. Heritage aircrafts including a DC3 Dakota, a CF-100 Canuck, a CF-101 Voodoo, a CF-104 Starfighter and a CP-107 Argus may be seen here. Car and passenger ferries run to Powell River on the Sunshine Coast (the mainland) north of Vancouver. Exhibits include native, Chinese and Japanese culture and logging and farming equipment may be found in the Native Son's Hall, located at 360 Cliffe Avenue. This down hill and cross country ski area is in Strathcona Provincial Park. During the summer months the lodge is used by guests enjoying good alpine fishing and hiking. It is a 25 minute drive from Courtenay. This famous ski area is located 31 km (19 miles) west of Courtenay and provides guests with nordic and downhill skiing opportunities as well as brilliant mountain and forest views. Further north on Hwy 19 is the Miracle Beach Provincial Park with good camping facilities. Turn east off of the highway 24 km (15 miles) north of Courtenay. A naturalist's paradise, this water access only park can be visited through tours at the Courtenay Infocentre or by private craft. Attracting thousands of fisherman each year, the salmon capital of the world offers avid anglers excellent saltwater fishing opportunities. 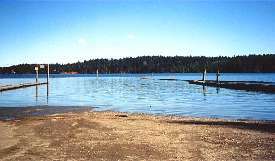 The area surrounding Campbell River is also well known for its freshwater fishing. Featuring displays of native culture and heritage, particularly that of the Kwakiutl and Nootka First Nations, as well as pioneer history. The museum is located at 470 Island Highway. This family home of the famous outdoor writer and environmentalist, Roderick Haig-Brown who passed away in 1976. His former home is now host to several fly fishing and naturalist events. Both islands offer excellent camping, fishing and hiking opportunities. Ancient Indian rock carvings and petroglyphs are found on Quadra Island. Car and passenger BC Ferries make hourly trips daily (10 minutes) from downtown Campbell River to Quadra Island. Ferries to Cortes Island run from Heriot Bay on Quadra.